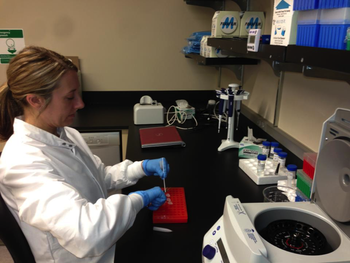 The founders of Paw Print Genetics, Lisa G. Shaffer, PhD, FACMG, CEO, Blake C. Ballif, PhD, Director of Operations, and Kyle Sundin, Senior Manager, Development and Laboratory Operations, worked together prior to starting PPG in a human genetics diagnostic laboratory. Human clinical genetics laboratories follow the Standards and Guidelines set forth by the American College of Medical Genetics and Genomics (ACMGG). Because there were no standards in canine testing and our founders were used to working under the guidance of the ACMGG, we set up our laboratory, protocols, policies and procedures as if PPG was a human genetics diagnostic laboratory. As such, every gene mutation has been validated for analytical sensitivity and specificity. We test each gene mutation region with two independent methods and the results of those two methods must agree before reporting. This methods-based internal proficiency allows us to provide breeders the highest accuracy possible. In addition, Dr. Shaffer is board certified by the American Board of Medical Genetics and Genomics and has led human testing laboratories for over 25 years. Since 2013, we have discussed the need for standards and guidelines in public forums and in peer-reviewed publications (Importance of standards and guidelines for veterinary genetic laboratory services, Ramirez et al., 2017). As the quality of the available clinical testing cannot be determined from a laboratory’s website or marketing materials, and criticisms have become very public, Paw Print Genetics has led the effort to develop universal standards and guidelines that all canine genetic testing laboratories could implement. The laboratories that participated in the new standards and guidelines came together to compare good practices across our organizations and the result is the publication that appeared this week in the journal Human Genetics. We anticipate that these standards and guidelines can form the basis of on-going quality assessment of laboratories and can start with a self-assessment based on our publication that will hopefully develop into more formal standards and guidelines, voluntary implementation across all canine genetic testing laboratories, and eventually an external proficiency program in which samples are sent between laboratories and tested for consensus genotyping results. Paw Print Genetics is proud to have led this effort to promote better practices among clinical testing laboratories to improve the accuracy of testing. We recognize that breeders use the results provided by genetic testing to make breeding decisions, spay and neuter decisions and sometimes even euthanasia for lethal or critical conditions. Our view has always been that the highest accuracy possible is the only option. We hope that other laboratories will implement these Standards and Guidelines that Paw Print Genetics has been practicing since our inception. Our goal is to continue to raise the bar in canine genetic testing to ensure good laboratory practices, the highest accuracy, and responsive and helpful customer service.